The Richmond night market, just outside of Vancouver, BC in Canada is the largest night market in North America. It draw in over 1 million visitors a year with its exciting array of Asian food and Hello Kitty merchandise. If you love Asian street food, you’re going to love this night market! While the Richmond Night Market is only a quarter of the size of some of the night markets we visited in Asia, it has all the sights and sounds you want in a night market. The crowd is so thick you have to elbow your way around and the smell of deep frying lingers in the air. The plethora of Hello Kitty junk and cheap cellphone cases almost lure you in. The sights and sounds are overwhelming from the moment you arrive at the large dusty grounds where the Richmond Night Market sets up camp each summer. The giant rubber ducky greets you at the entrance. The line to get in is atrociously long, but if you spend a few more bucks and buy an express pass, you’ll get right in, skipping past a couple hundred of your fellow market goers. The market is one of our favorite things to do in Vancouver, and we make the annual pilgrimage to Canada at least once every summer to attend. There’s really nothing else quite like it nearby. I love how I can almost forget where I’m at for the evening. It feels like Japan or China or Thailand, even if it’s only a mirage. Once inside, there’s an entertainment stage where something interesting is always going on. I never spend much time there though, nor around the midway games or even browsing around the vendors selling phone cases and pajamas. Instead, I make a beeline to the back of the venue where the food vendors can be found. Let’s be honest, the food is why people go to the night market, so you might as well cut to the chase. Also, the food area becomes very packed with lines starting to form by 8pm, so it’s a good idea to get food first and look around later. 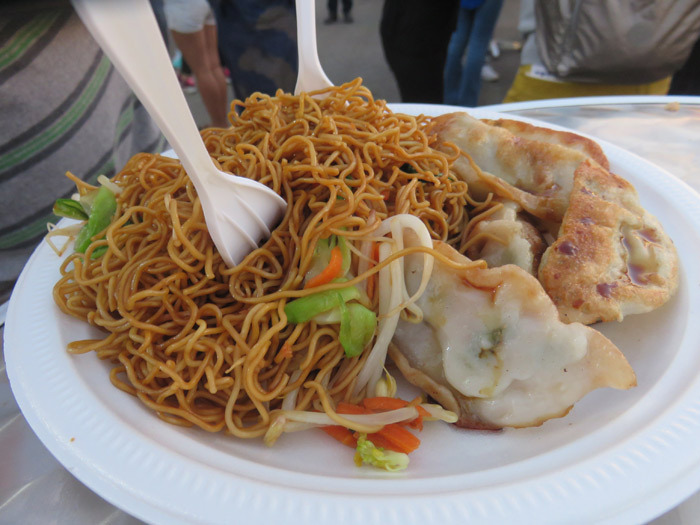 I’m an adventurous eater and I love finding new International dishes to try, and the Richmond Night Market is practically made for people like me. All of the area’s best International cooks have a booth where they sell incredible plates of food from all over Asia, and even a few from elsewhere (I’m pretty sure I saw some Bratwurst and Pretzels, once). My favorite of everything at the market is the Rotato. It’s a huge hit and there’s always a giant line to order. 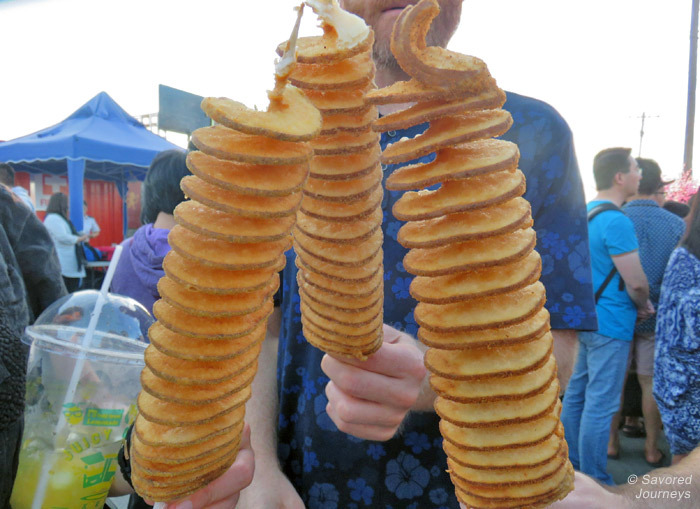 They take a whole russet potato, spin it on their spiral cutter and make a slinky on a skewer. Then they deep fry it to golden perfection and coat it with the flavoring of your choice. I always go for BBQ or Honey Mustard. 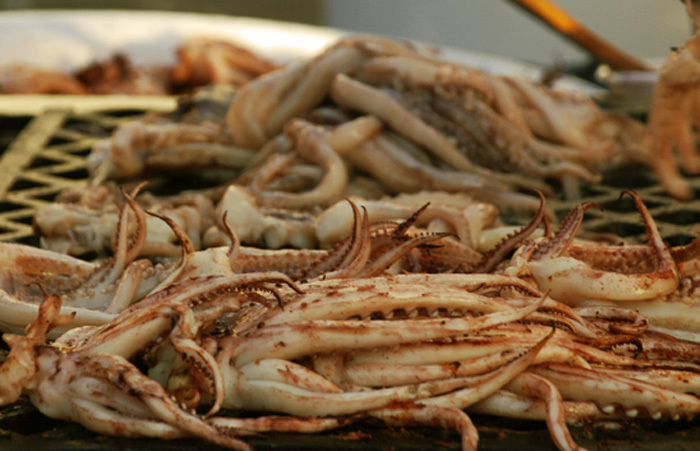 Another top specialty at the market is squid. At least a dozen different vendors sell squid in all different variations. Usually it’s a giant plate of grilled squid or a heaping pile of giant fried calamari rings for about $8. It’s probably the best deal at the market. But you don’t want to fill up on one thing. There are too many things to try to eat only one dish. I always look for the best chow mein or noodles. We’ve had Yakisoba that was incredible. 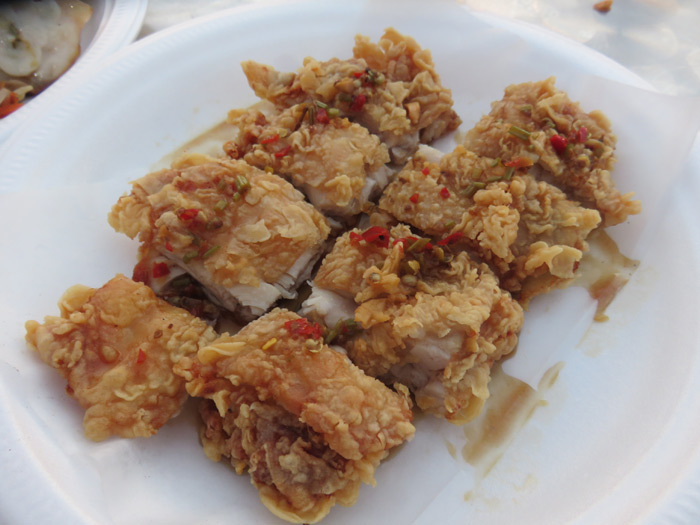 This year we tried a Thai crispy chicken that was outstanding. Spicy, saucy and crunchy – so good. Other foods you’ll find are dumplings, pork buns, chicken skewers, sushi, rotisserie chicken, a variety of bbq meat, soup, candy, fresh squeezed lemonade, fish balls, etc. It’s hard to even explain how many different choices there are. 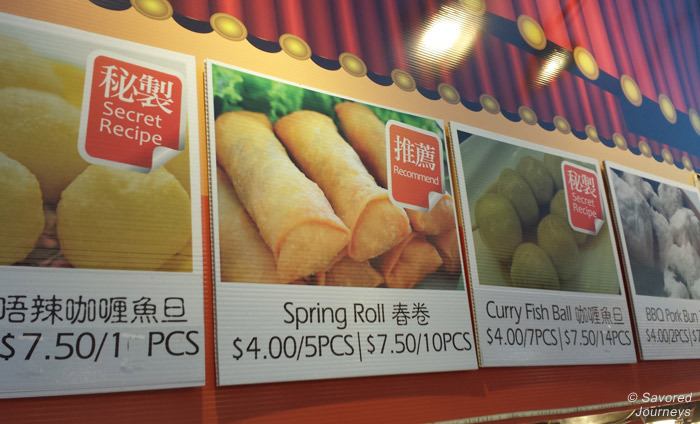 Most things are served in small quantity for around $5 so you can try multiple things. Some are more generous and cost up to $8. And there are a few things that are cheaper even. 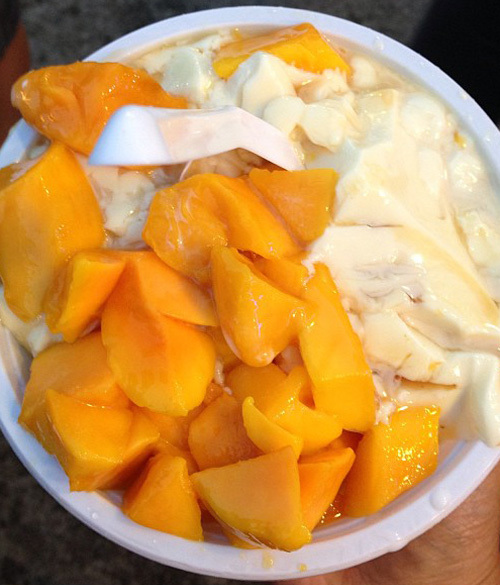 For dessert, my favorite thing to get is mango sticky rice. This year we found some durian sticky rice. 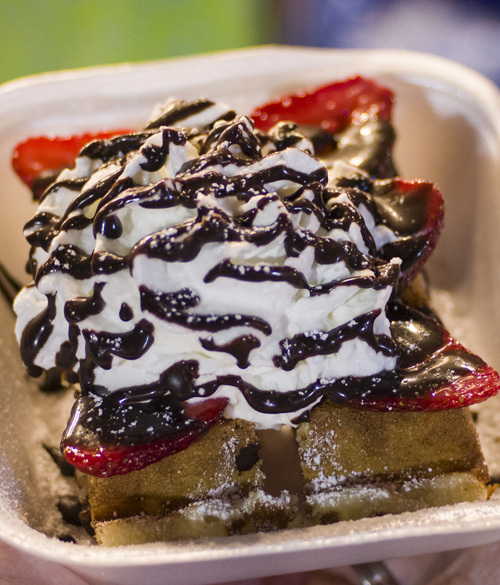 There are also decadent Belgian waffles, fried ice cream, floats and even deep fried snickers and oreos. The night market runs from mid-May to mid-October each year. It’s open from 7pm to 12am on Friday and Saturday, and from 7pm to 11pm on Sunday and holidays. The cost of admission is $4.25, but children 10 & under and Seniors 60 & up are free. You’ll want to make every effort to arrive by 6:30 to get in the line that rapidly grows to epic lengths. By 7:30pm on most summer nights, the line will be at least 45 minutes to an hour long. This is when it’s a better idea to buy the zoom pass. If you don’t get there early enough to beat the line, the next best thing is a Zoom pass, which will cost you $25, but will allow you to skip the line. Zoom Passes great for return visits, because there are 6 passes included in the pass, and they are fully transferable. So if you’re going to go back more than once, or you have friends who might want to go later, they’ll surely get used up. Alternatively, if you have more people in your party, you can all get in on the same night using the zoom pass. I went with 3 of my friends and we used the zoom pass for all 4 of us to get in. It would have cost us $17 regularly. So for $8 more, we surpassed the atrocious line and got right to eating! Worth it. It’s a small price to pay. The market features at least a hundred vendors selling all kinds of food, drinks, desserts and trinkets. There are midway games, entertainment all night long and plenty of people watching. The best way to get to the Richmond Night Market is to take the Skytrain. Driving is futile and will probably cause you more stress than it’s worth. Not only is traffic really congested getting there, the parking lot is a fiasco. If you’re already in the city, take the Canada Line in the direction of Richmond. The stop you get off at is NOT Richmond. We’ve made that mistake before. Get off at the Bridgeport Station. You’ll see the River Rock Casino just beyond the station. Head to the right when you exit the station and follow the stream of people. If you’re unsure where to go, look beyond the casino in the distance and you’ll see the giant rubber ducky. Get there early to avoid the lines. Stay late to get closeout deals on food when the vendors start shutting down for the night. Go hungry. I mean really hungry. Pick up a coupon book at the entrance with some useful coupons for food. It gets crowded, so it’s not easy to walk around first and then decide what you want to eat. Instead, when you see something you like, just get it. You’ll thank me later. There’s very little seating available, so be prepared to stand and be moving around all night. Take plenty of cash. Some vendors might take a card, but most don’t. It’s not always possible to stay with a group of people – pick a meeting spot and have everyone bring their food back there to eat. Be adventurous and try new things. We always choose to stay somewhere in downtown Vancouver, because of the easy walking proximity to just about everything. You can park your car and use your legs instead. Popular areas include Gastown, Yaletown and Downtown. No matter which area you choose, you’ll find some really great restaurants and bars within a block or two that exemplify the neighborhood. 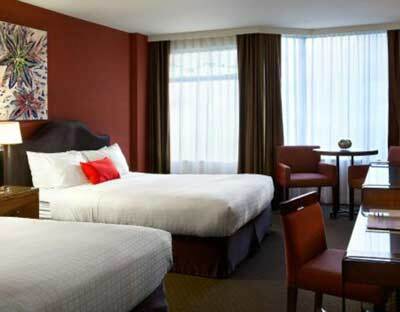 4.5-star hotel in downtown Vancouver (West End), stellar location, great restaurant. Comfortable 4-star hotel with a spa, restaurant, and free wifi in downtown. 5-star luxury hotel with beautiful, well-appointed rooms and an outdoor pool. We go to the Richmond Night Market at least once a year. It’s so much fun and sooo much great food. It’s really one of the best Asian night markets we’ve seen outside of Asia. Have you been? Tell us about your experience. This entry was posted in Attractions and tagged Richmond, Vancouver. Oh, food markets must be one of the best inventions! It’s a must whenever I go somewhere. That and a good viewing point! You’re lucky to have a such of good food market in Vancouver. 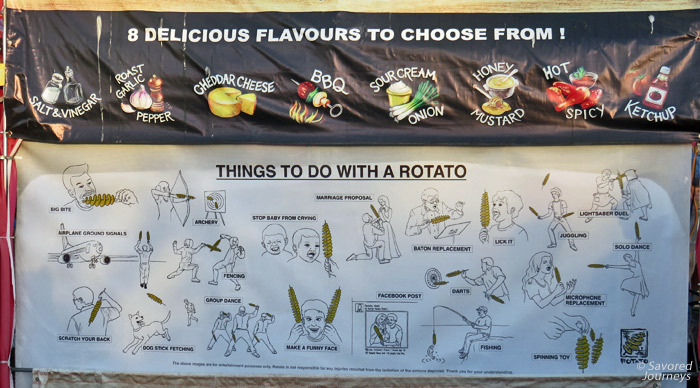 I’ve never seen or tried a rotato but I guess I’d love it. I love markets – Asian markets are great, that’s for sure, but actually, wherever you go, there are some great markets to discover. In Italy we have Rotato as well and i simply love it!!! Delicious!! I live in Milan and I’m so happy that thanks to EXPO we have now a brilliant permanent market close to where I live!! And it’s mainly dedicated to green, eco and slow food!! Those are all the best things! You’re super lucky to have that market nearby. That sounds (smells and tastes) like so much fun. I love big local markets and your tip to beeline directly to the food vendors is spot on. Hope to check this out one day. Yes, the direct beeline to the food is the key to not having to elbow your way through the crowds when it starts to get busy. Bypass the line! I love everything about Vancouver, too. It’s such a great city. I could definitely live there. And yes, I did eat those rotatoes. Mine was BBQ flavor and it was divine. Any food market tells the best story of the place. I love visiting such food markets. I love the food they sell on markets. I could stay there for hours and just eat and try everything. But the Richmond night market actually sounds to crowded for my taste. Yes, it can definitely get crowded. It borders on too much for me too. You just have to get there early, and avoid Saturday night. I love Vancouver and I’ve wanted to check out this market for a while. I’m a flight attendant and one of our layover hotels is in Richmond. Last time I was there, we saw the line of cars driving down the road near the sign for the Night Market. If we hadn’t had a super long day I would have gone. Next time, I’m there!! Umm yes, I’ll take some rotatoes to go! Yummmm! Thanks for the insider tips! Bobbi, you picked the best thing on the menu! I’m so addicted to Rotato! Would definitively need to go there hungry! Yes! I love markets like these! there’s so many in London and it’s great! Thanks for the tip on the express pass – more markets should have this kind of thing! If you say that this is unrivalled I absolutely trust your judgement – will try and organize making the pilgrimage to Canada for the next one – hopefully see you there! Meg, if you ever do make it back to Canada, we will most definitely meet you there! Laura, you always write such great, detailed posts. I definitely want to check out this market! All that food looks awesome, and the entertainment sounds great too. Thanks for sharing your insider info about this cool event!! Thanks Jennifer! I just get excited about the food and want to share it. Glad you liked it. Everything looks so goddamn gooooooood! It’s awesome that the world can be brought to your front door these days and with all of this amazing food, I’d definitely go! Happy to see the durian there especially! The food looks amazing and if I’m living in N.America, I’ll definitely check this out too! This is a great post, thanks! We will be in Vancouver in early June and want to check out the market. You mentioned the Zoom Pass as a great way to avoid the line but is that for subsequent visits? On your first visit do you wait in the long line to purchase the Zoom Pass too? Maureen, so excited that you’re going to go to the Richmond Market. When you get there, don’t stand in the really long line to buy the zoom pass – just go straight to the entrance and tell them you want to do that. There are also touts moving along the length of the line selling those passes, so you can skip the line.